Stunning looking, decorative storage boxes with removable lids. Look great in any room. Useful safe storage place for all kinds of items eg. Keys, jewellery, cosmetics, keepsakes, the list goes on!! Also makes very special reusable luxury gift boxes. 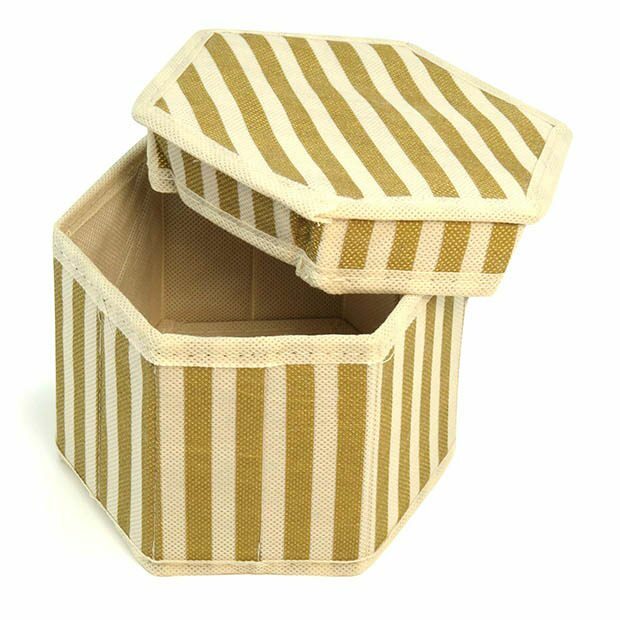 High-quality polypropylene fabric in gold and ivory stripe design. Strong board construction. Can be stacked. Space-saving flat-packed design for when not in use. Medium & large sizes have side handles. Complimentary to our wedding box range - acid-free and breathable for safe long-term storage. Sizes: Small:Width x Height 5.9'' x 5'' (15cm x 13cm) approx.